Do I say Ta Dah? Do I say Hooray? 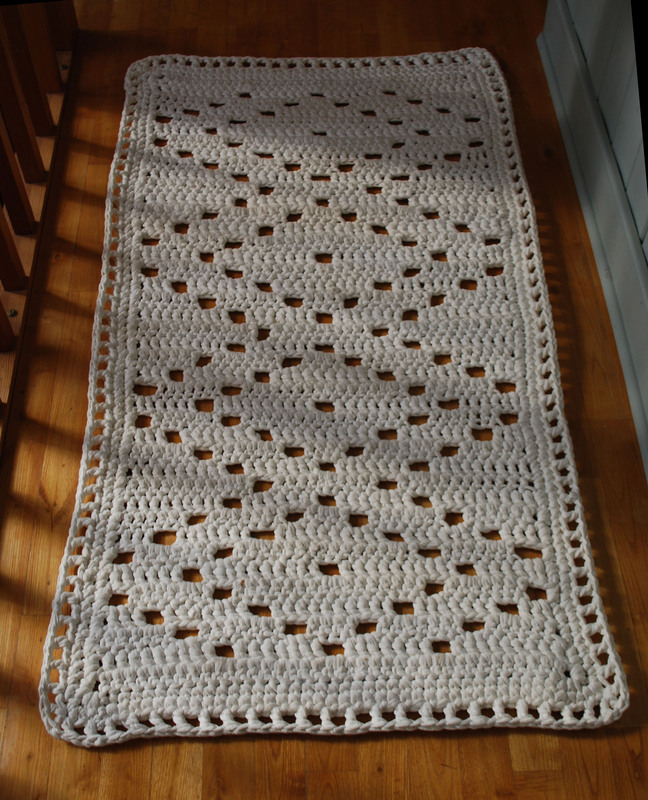 Anyway, the rug is complete and I, after a bit of tweaking I am really pleased with it. It feels lovely underfoot and doesn’t slip around on the wooden floor as I had feared it would. We shall just have to see how that whiteness fares with the little ones around! 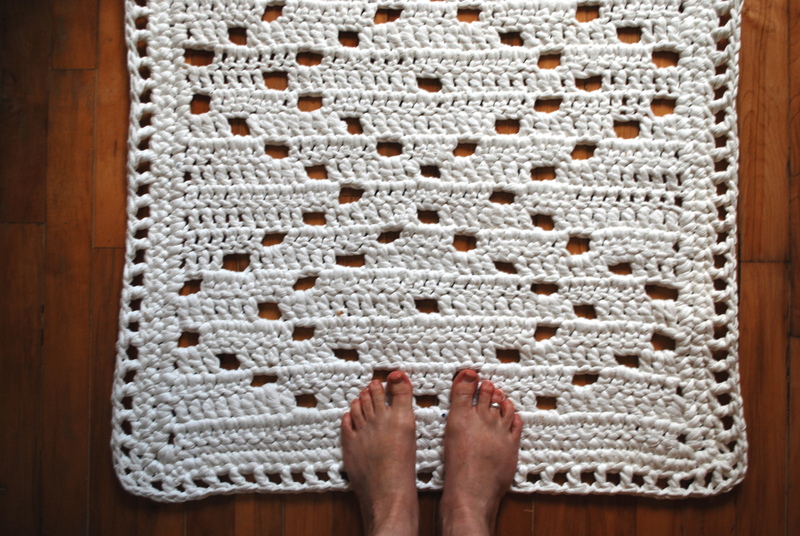 I made up the pattern based on this picture I had seen on Pinterest and I haven’t achieved the same level of finesse but I think this one must either be much bigger or uses a finer and more regular yarn. I simplified the pattern because this one wouldn’t have fitted between the sink and the shower! 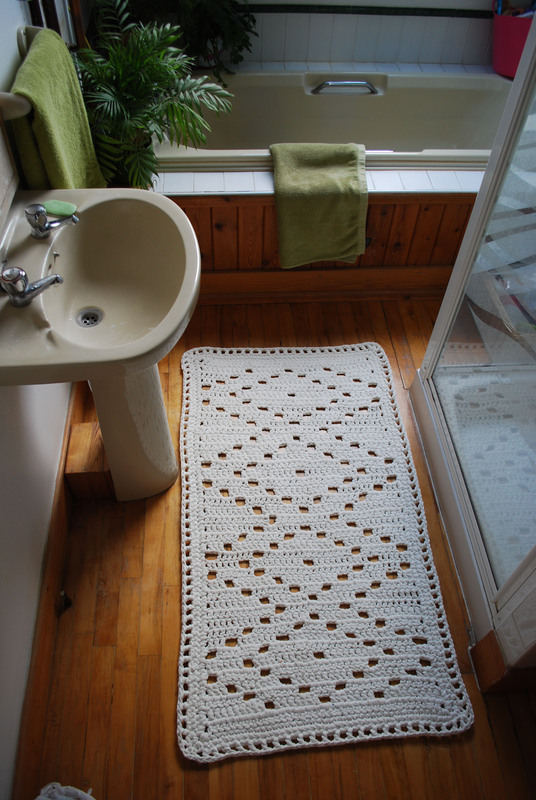 This is our bathroom with rug in situ. In case you are wondering, I am fairly sure that the avocado sink and bath will become ‘vintage’ some time soon! You can clearly see the variation in yarn weight in this picture, some patches are very dense and other quite loose. It also looked RUBBISH until I put the final border on, in fact it very nearly ended up as mulch mat for the flower bed it looked so wonky. As it is, it will now grace my bathroom and soak up shower drips for years to come. It is also completely machine washable and dyeable so if that whiteness starts to tend to the grey I can always spruce it up. Thanks for visiting. It is lovely! Maybe a bit uneven in places, but for something that is intended for feet and shower drips, that’s quite alright – floor things get beat up quite a bit anyway! It looks just wonderful. A love a really useful, but stylish make. And yes, I think the avocado suite has already come back around.